The accepted dogma on salt is that very little should be consumed or a higher potential for heart attacks and strokes will follow from high blood pressure. But researchers from holistic health circles, including some independent MDs such as Dr. Brownstein, have embraced pure unrefined sea salt as vital for good health. The taboo on salt has been challenged. Despite its tenure in the archives of modern medicine dogma, this taboo is cracking. The urge to reduce sodium intake from processed foods is a good thing for anyone. Those sodium contents are heavily processed and some are toxic. MSG is mono-sodium glutamate, for example. Until sea salt started to find a strong steady market, all table salts were highly processed and bleached. The result was 90% sodium without hardly any of the minerals that come with unprocessed sea salt. Actually, those with high blood pressure (and everyone, really) should just consume more foods rich in potassium, no matter the level of salt consumption. Meta-analysis’ show how low potassium intake has the same impact on blood pressure as high salt consumption – the real problem is an imbalance between sodium and potassium. Then add bleaching agent residue and aluminum to the processed salt toxic package and you have even more of a health hazard. Evidently the causal link of salt consumption for high blood pressure to heart attacks is weak. But the right type of salt should be used for optimum health. Though we all need sodium to live and function efficiently, our bodies have a hard time recognizing it from refined salt. Digestion and metabolism become imbalanced, perpetuating toxicity internally. Our blood salt content closely resembles sea water salt content. All unrefined salt, regardless of its current origin, came from the sea originally. And crafty marketers use that fact to sell sea salt that’s been processed, expelling most of the nutritional value and perhaps adding toxic residues from the processing. Here’s a short guide to help you understand different types of salt. Pure salt can be sourced from ancient caves as well as seaside beds. It’s usually left out to dry naturally and is never bleached or otherwise processed. Pure unadulterated salt has been consumed by humans for centuries. Over the past few decades, industrially processed salt has taken over our cuisine and has been overly used in packaged and fast foods. And that is the type of food that actual sodium sensitive types should restrict, especially since those nutritionally empty foods are also full of toxic ingredients. 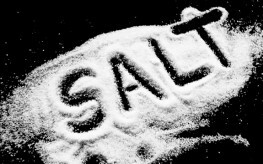 1) Salt helps stabilize and regulate heartbeats, thanks to its magnesium and sodium content. 2) Sodium is essential for proper muscular function. 3) Salt helps minimize the effects of stress by maintaining proper melatonin, serotonin, and tryptamine levels in the brain. 4) Salt helps the body hold water sufficiently for proper cell hydration. 5) Salt helps remove cellular acidity, especially in the brain and kidneys. Thus it is an alkalizer. 7) Since salt is taken into bone matter as part of strengthening bones, it could help prevent osteoporosis. 8) Sea salt provides a buffer for blood sugar levels to help prevent diabetes or to help those who are diabetic use less insulin. 9) Sea salt provides iodine in a natural setting, making it easier for your thyroid to absorb it and to regulate the endocrine system. 10) It tastes better. Drink plenty of water when consuming salt. Salt with calcium and magnesium reduces blood pressure in many cases, and prevents acid reflux / heart burn. absolutely true that unrefined sea salt has many benefits – including bone/nail/hair strength… I was drinking about 1 tsp/day in spring water in summer of 2013 b/c so HOT and so dehydrated…I felt great, and THEN I noticed – no twitching in legs at night (no potassium imbalance) and a fingernail that kept splitting tip to base – stopped splitting and my nails were got long, smooth and very durable – they were even hard to file. The stuff is awesome. I agree completely, table salt is harmful to the human body but sea salt is the opposite, very healthy. I order 150 to 200 pounds of Himalayian sea salt at a time. It comes in golfball sized chunks and has so many minerals in it that it has a deep maroon color. I use my commercial meat grinder to grind it down to fit in a salt shaker. i don’t believe in this one.